Reducing energy cost makes perfect business sense; it saves money, enhances corporate reputation and helps everyone in the fight against climate change. Electric AC motor works at fixed speeds and are ideally suited to applications where a constant output speed is required. However around half of all motor applications have some kind of varying speed demand and this includes processes such as moving air and liquids (fans and pumps), winding reels and precision tools. Historically in applications requiring precise speed control such as paper winding reels expensive direct current (DC) motors or hydraulic couplings were used to regulate the machine speed, whereas in other applications the processes have been controlled by opening and closing dampers and valves, or changing output speeds with gears, pulleys, and similar devices whilst the motor works at constant speed. In the 1980's and 1990's, variable frequency drives started appearing on the electric market offering an alternative method of control. A variable frequency drive, also called frequency inverter, adjustable speed drive, the basic working principle is adjusting the electrical supply to an AC motor with a corresponding frequency and voltage change in the motor's speed and torque output. By implementing this type of control a very close match between motor speed and the process requirements of the machine it is driving may be achieved. 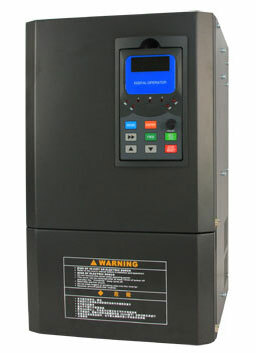 Variable frequency drive technology is now mature and enjoying widespread adoption and use with AC motors; Variable frequency drives are extremely versatile and offer a high degree of motor control where motor speeds can be accurately varied from zero rpm through over 100% of the rated speed, whilst the torque is also adjusted to suit. Different options are available to suit a variety of applications; basic variable frequency drive designs are used in simple applications such as fan and pump control whereas more complex versions might be used for very precise speed and torque control in for example multiple winders or materials forming applications. 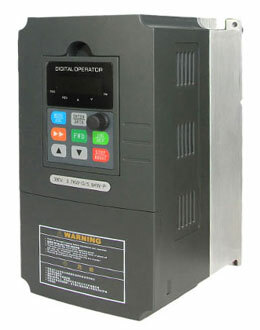 Sizes of variable frequency drive capacity range from 0.2kW through to several MW; they are usually available as standalone devices and are connected to the motor's electrical supply, however on some smaller motor designs, usually under 15kW the variable frequency drive may be built onto the motor and is available as an integrated motor-drive product. In many applications variable speed control can lead to a substantial reduction in energy cost. The use of variable frequency drives is particularly effective in fan and pump applications where they might be used to replace traditional methods of output regulation; here an exponential relationship exists between the machine speed (and output) and the energy used. Rectifier: the working principle of rectifier is changing the incoming alternating current (AC) supply to direct current (DC). Different designs are available and these are selected according to the performance required of the variable frequency drive. The rectifier design will influence the extent to which electrical harmonics are induced on the incoming supply. It can also control the direction of power flow. Intermediate circuit: the rectified DC supply is then conditioned in the intermediate circuit, normally by a combination of inductors and capacitors. 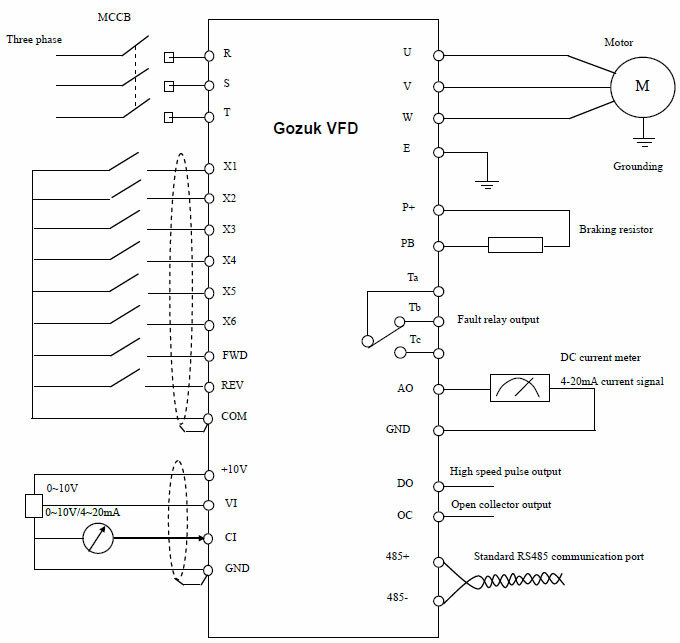 The majority of VFDs currently in the marketplace use a fixed-voltage DC link. Inverter: the inverter converts the rectified and conditioned DC back into an AC supply of variable frequency and voltage. This is normally achieved by generating a high frequency pulse width modulated signal of variable frequency and effective voltage. Semiconductor switches are used to create the output; different types are available, the most common being the Insulated Gate Bipolar Transistor (IGBT). Control unit: the control unit controls the whole operation of the variable frequency drive; it monitors and controls the rectifier, the intermediate circuit and the inverter to deliver the correct output in response to an external control signal. Variable frequency drives are typically 92-98% efficient with 2-8% losses being due to additional heat dissipation caused by the high-frequency electrical switching and the additional power required by the electronic components. Equally motors connected to variable frequency drives experience some additional losses due to heating caused by the high frequency electrical switching. Electrically, a variable frequency drive is installed in series between the mains electrical supply and the motor. Large variable frequency drives can introduce electrical 'pollution' in the form of harmonics onto the supply which can be detrimental to other equipment; in China regulations limit the amount of harmonics that are permitted on the supply; depending on the local circumstances the installer will have to consider installing electrical filters or specify the rectifier type to ensure compliance is achieved. Most variable frequency drives offer computing intelligence and are able to work with a variety of control systems and sensors. A basic variable frequency drive will be able to control a motors output in response to a control signal in order to achieve the desired operating condition. In the simplest of applications the variable frequency drive will be interfaced to a transducer such as a pressure, or flow rate sensor, and then programmed to maintain a preset value (set point). At the other end of the spectrum advanced variable frequency drives can perform complex process control tasks; they may be interfaced to a number of transducers, implement interlocks and other control functions, and interface with modern computer networks providing real time operating data. Being electronic equipment variable frequency drives are susceptible to damage through dust and humidity ingress, or inadequate cooling. They should be located near the motor in suitably ventilated enclosures or remotely in a suitably protected area. Larger VFDs can generate a lot of heat, and this must be removed or the unit will eventually overheat and fail. Step 1: Develop an understanding of the process in question and how the operation of the motor system meets its requirements. Determine to what extent the demand is variable and whether the demand can be reduced. Document the load profile and establish by how much it can be reduced. Step 2: Determine the load type, whether it is variable torque, constant torque or constant power. Establish whether variable frequency drive control can be implemented on the system or if another solution will be more appropriate. Step 3: Look for opportunities to maximize the existing system efficiency through low cost measures. There is little benefit in fitting a variable frequency drive to a system which suffers poor efficiency that could be improved by other low cost means. Assess the condition and operation of the system and identify low cost energy savings opportunities that could be implemented prior to fitting a variable frequency drive. These could include maintaining equipment, or reducing demand and switching off. Some of these improvements may be implemented through actions taken in-house, whilst other actions may require specialist support from a manufacturer or agent. Step 4: Monitor existing energy consumption and estimate the energy saving potential. If possible, monitor the power consumption over, say, one week to gain a baseline against which any improvements in energy efficiency can be measured. Seek expert help where necessary. Obtain quotations from manufacturers and ensure the savings and payback on investment are satisfactory. Step 5: Having taken into account the points described in 'Practical Considerations' install the variable frequency drive and associated controls. Ensure the installer is fully briefed prior to commencing work, and that the system is properly commissioned and savings are demonstrated prior to sign off. Step 6: Continue to manage your systems for energy efficiency. Put in place policies, systems and procedures to ensure that systems are correctly serviced and operating efficiently and that savings are maintained in the future. The installer has been suitably trained and is competent to install variable frequency drives. The intended process operating profile and control method are fully understood and communicated with the variable frequency drive installer prior to commencing the installation. The variable frequency drive is correctly programmed to deliver the intended operation (and energy savings) and that this is demonstrated to operators/ engineering staff on completion. Operators/engineering staff are trained in controlling and working of the variable frequency drive. A commissioning file containing records of software settings, set points and other relevant programme parameters is compiled and stored for future reference. Once a variable frequency drive has been installed and worked well, energy savings can be maintained or improved further by carrying out regular maintenance. A demanding environment, such as high ambient temperatures or a heavy load, which measurably reduces the life of the VFD components. Setting incorrect parameters, resulting in poor control and energy wastage. Insufficient cooling, which leads to increased energy use. An increase in heat will increase electrical resistance, automatically causing the current to increase to compensate. This increased current equates to increased power consumption. Overheating VFDs can lead to equipment failure. Contamination ingress (from materials such as water or dust) causing inefficiencies and equipment failure. Loose electrical terminals leading to overheating and failure. Production standstills or equipment breakdowns invariably entail cost, so a systematic variable frequency drive and equipment maintenance plan is recommended to reduce the possibility of equipment failure. Preventive maintenance is always less expensive than correcting faults and having unanticipated breakdowns. The VFD manufacturer might also recommend a schedule for replacing parts to make it work well, for example, an annual air-filter replacement or a four-yearly replacement of any cooling- pump seals. A good way to ensure a variable frequency drive is kept in good working condition is to enter into a maintenance contract with the VFD manufacturer. The Fact: variable frequency drives are not as expensive as you might think. Fitting one to an average motor can cost around $650 – including installation. When you consider that a single, average (2.2KW) motor can consume over $500 worth of electricity in a year, a variable frequency drive is well worth the investment and can have a payback period of less than two years. but also now have one confusion how do set parameter to vfd.